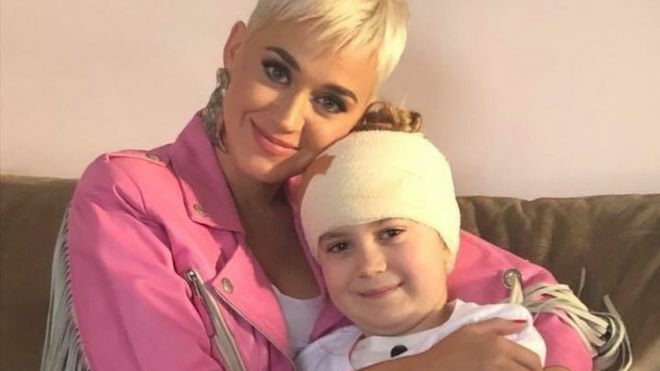 On Tuesday, Katy Perry visits a fan who wouldn't have been able to make it to her show. Katy Perry, Worldwide Superstar and winner of over 90 awards, was holding a concert as part of her new tour, "Witness", in Adelaide, Australia yesterday with many fans set to attend. There was only one issue and that was with her "biggest fan", 8 year old Grace Moores. Grace had been looking forward to the Adelaide Show since April, but later that month she was diagnosed with a Brain Tumour. Her surgery had been scheduled for the same day as the show! Grace was heartbroken! Grace's older sister Tiana tweeted out to try and get Katy's attention. This tweet caused all those who saw the post to start the hashtag: #HelpGraceMeetKatyPerry in an attempt to get the singers attention. The tweet gained a lot of traction, gaining over 20,000 retweets! On Monday Katy's Team saw the post and notified Katy of Grace's attempt to meet her idol. Immediately Katy got her team to contact the family and arranged to meet before the concert. Obviously, this delighted Grace and the two spent a few hours chatting and joking about things and generally just having fun. A dream come true for the youngster! Now, this is yet another example that the people in the music industry are people too, who have hearts and kind personalities. This shows to people that even during the busy schedule, artists will make time for their fans, be it respond to fan mail or even go to their house like Katy did. This just further proves to non-believers that there is a lot of good in the industry!